The Erosion of Free Speech by Muslims in America. We Americans are losing our country to an enemy that is methodical, and determined to bring about their belief of justice and democracy. In the Middle East, speaking out against Islam or their prophet will get you killed. In America it gets you fired, labeled and silenced.. Do not think for one second Islam promotes tolerance, or that Muslims believe in the First Amendment. They do not, however they will use the First Amendment to their advantage. The Constitution is a man made document, Muslims do not follow or adhere to anything unless Allah created it. 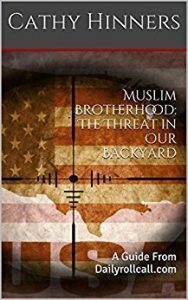 Across the country, there have been several examples of Americans speaking out against Islam, which follows up with the terrorist organization CAIR/Hamas demanding they be removed, or dismissed from their positions. In McKinney TX, two Cockrill Hill Middle School teachers were forced to resign due to comments made on their own social media pages, which referred to Islam as a “satanic death cult,” an “evil ideology,” and “a political ideology…that cannot assimilate. It must dominate. Justin Barton and Mark Russell are both 100% correct in their assertions, but because it was the truth, but “offensive” to Muslims , they now are unemployed. In other statements on social media, one of the teachers stated transgenders were “mentally ill”. which CAIR also was offended by. Imagine, a religion that calls for the death of homosexuals by throwing gays off of buildings is offended. (http://dfw.cbslocal.com/2018/01/20/mckinney-isd-teachers-resign-controversial-social-media-posts/) Watch here as Imams and Islamic religious scholars discuss death for homosexuals. In the political arena, CAIR/Hamas welcomed the firing of “Islamophobic White Supremacist” strategist Steve Bannon, condemned Trump’s pardon for Joe Arpaio, while also welcoming the resignation of Sebastian Gorka. Trevecca University president Dan Boone has stated that no Islamic group had interfered with his decision to revoke the use of their facility, however CAIR’s sister organization AMAC (American Muslim Advisory Council) obviously states otherwise. In Islam, there is no such thing as freedom of speech, or expression of thought. Muslims will rebuke that though by using Taqiyya, or the art of deception to gain sympathy and support. For now Muslims are making great gains in places or positions of power. If this trend continues, America will fall to their intended goal, the return of their one god (allah), one law (sharia), and one government, the caliphate.